The people who helped make Batman are being unmade. First Leslie Tompkins was murdered. Then Alfred was attacked. 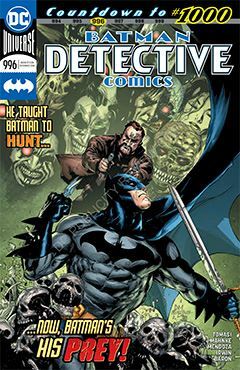 Now Batman is following the clues to lead him to others that recognize the Bruce Wayne connection, and may be either predator or prey. The trail leads all over the world, and reminds me of the original Ras al Ghul story from the Bronze age. Mahnke seems to be channeling his inner Neal Adams, which is almost never a bad thing for any artist. Kudos to inkers Jaime Mendoza and Mark Irwin for maintaining the integrity of Mahnke’s pencils, permitting the artwork to remain consistent throughout. All this is building toward the landmark Detective Comics #1,000, which will (hopefully) include a bit of a re-set for the Batman family. As Bruce tells Damian in one scene, “When this over, you and I need to talk – straighten out this thing between us and make it right.” I’ve always believed their relationship to be tenuous, and as a reader I would appreciate a greater degree of comfort there. I’ve been enjoying this storyline, as much as two chapters will allow. It has distilled Batman down to his comfortable basics, much like Batman: The Animated Series once did. I am hopeful this trend continues for the foreseeable future, making one of DC’s flagship characters accessible to all.